StringTokenizer class in Java is used to break a string into tokens. str is string to be tokenized. carriage return and form feed. separate tokens. 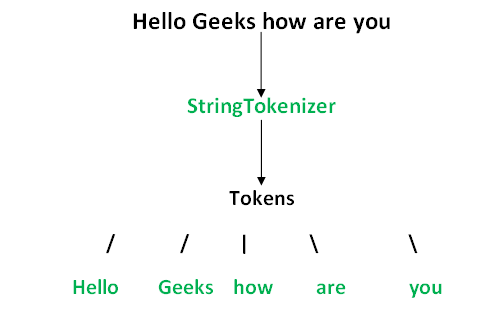 For example, if string is "hello geeks"
and delimiter is " ", then tokens are "hello" and "geeks". geeks" and delimiter is " ", then tokens are "hello", " "
We will soon be discussing methods of StringTokenizer in separate posts.